Lyrics to the song A Hard Rain's A-Gonna Fall as recorded by Bryan Ferry. Oh where have you been, my blue eyed son? Oh what did you see, my blue eyed son? What did you see, my darling young one? Oh who you did meet, my blue eyed son? Oh what'll you do now, my blue eyed son? 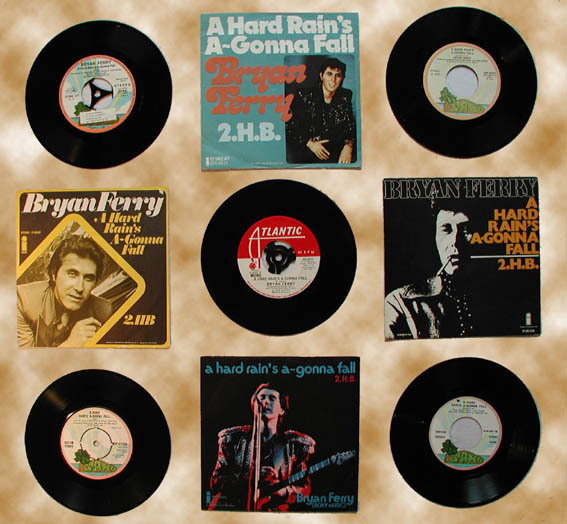 Bryan Ferry released 'the single 'A Hard Rain's A-Gonna Fall on 17th September 1973. This was Bryan's first solo record. His version of the Bob Dylan track raised a few eyebrows with its completely new interpretation. Bryan took the 3/4 acoustic track and turned it into a 4/4 stomping rock track. The single was backed with a re-recorded version of the Roxy Music track 2HB and reached number 10 in the UK charts in October 1973. This was the first single from the These Foolish Things album and was the first of over 80 songs to date written by other people to be released by Bryan Ferry. Bryan performed this song during his 1974 mini tour and also at some shows during the As Time Goes By, Frantic & Dylanesque tours. Roxy Music also performed this Ferry solo track during their 'Siren' tour when the set list also included Diamond Head & Wild Weekend from the Phil Manzanera & Andy MacKay solo albums. A Hard Rain's A Gonna Fall was also used 20 years later as a B-side to the single Will You Love Me Tomorrow. The song was originally cut down to a 3:22 version but the album version was eventually used on the 7". This short version was available on a USA 7" and was this version was eventually released on CD for the first time on The Best Of Bryan Ferry in 2009..
"It's not meant to be jokey," Bryan insists, anxiously. "It's very serious. I think it's a beautiful song, although I can't be bothered with all that Cuba Crisis stuff but his intentions where completely sincere. Dyan's original was a poem with guitar backing but there are a hell of a lot of images in that song that I wanted to emphaisize muiscially . I thought it would sound good as a rock number...but the simple fact that it was controversial was a good thing"